Diwali is over, but Diwali spirit is still going on moreover we are heading towards holiday season again and I was thinking of some unique and easy on pocket gifting ideas for my dear ones. We are all bored and tired of gifting sweets, cards and flowers over and over again, don't you think so? I had been racking my brain and that's when suddenly an idea flashed in my mind. "Art enables us to find ourselves and lose ourselves at the same time. " - Art is personal and it shows how much you love and care. - Art is one of a kind and affordable gifting idea. - Art fills up the dull and stark space and transforms it into a cheerful place. 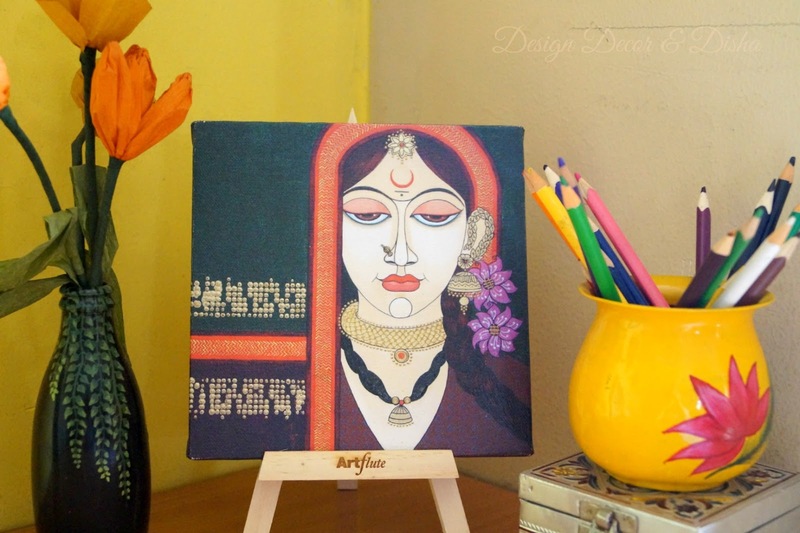 As I said I was looking for some affordable and unique gifting ideas so keeping that in mind let me introduce to you an online art destination that carefully curates a collection of art- both Indian and international- 'Artflute'. Disha: Please let us know more about you and Artflute team. Padmaja: I am the co-founder of Artflute, an online marketplace for contemporary art that aims to turn every home into a gallery. My role is best described as that of an Experience Engineer enabling a seamless experience for not just art enthusiasts but also for the artists, galleries, consultants and our on-ground partners (interior decorators, printing and framing stores). I especially enjoy enabling fulfilling experiences through real-time dialogues that guide consumers, artists and other stakeholders towards finding newer ways of experiencing art. Disha: How did the Artflute come into existence? Padmaja: A pioneer in the online space for art, Artflute was set up in 2008 at a time when artists were working mainly with gallery spaces. Since galleries set the prices for their art, artists didn’t have a way of ensuring they got a good price for their works. Artflute was set up with the intention of offering a transparent online marketplace for artists where they could price their own artworks and the commission earned was transparent. It also gave emerging artists a platform to further their career and established artists an opportunity to showcase their works to a global audience. Artflute is gradually growing into an ecosystem where artists, art curators, printing and framing stores and interior designers can come aboard to seamlessly leverage each others’ strengths and create a distinct experience for art buyers - novices and veterans alike. Each time we have a customer who connects to a piece of art that they otherwise considered beyond their own boundary, we are inching closer to our vision of turning every home into a gallery. In turn artists will be better supported and art will turn into a language that everybody speaks. Artflute has art from a wide range of contemporary artists from all over the world - emerging as well as established on its website. Disha: How Artflute stands out from the rest of the competition. Padmaja: Since our inception, we’ve been introducing a carefully curated collection of art for every kind of art enthusiast - a young collector or veteran, home or a corporate. And we have always been looking to create possibilities for everyone to enjoy world art. In our extensive customer interactions, we found that the first-time buyers are mostly intimidated by the experience of purchasing art and might be unsure of making a huge investment. So we introduced limited edition sensorial prints of original contemporary art that offer a great way to start experiencing art without spending a fortune. Once initiated to the world of art, buyers can graduate to originals as they develop their individual taste for art. Showcasing the unique style of an artist in the form of a reproduction comes with a huge responsibility and this is taken seriously at Artflute. Each reproduction is a giclée print on high-quality canvas and delicately hand textured by expert craftsmen. Not more than 100 limited edition sensorial prints of original works globally are released – each accompanied by a numbered Certificate of Authenticity verified by the artist. Only select works of an artist are made available as Limited Edition Prints so that art enthusiasts can experience the unique style of an artist without diluting the value of what they’ve created. We also have a unique art logic of art on subscription; we enable the possibility of experiencing more art for a lot less. You can think of it as a circulating library of art where you get to rotate art every quarter, half-year or year by just paying a subscription fee (annually). This idea has found favour with businesses - small and large corporates alike. Artflute is also bringing together the best of online and offline worlds with their exclusive Experience Centers at select home decor stores and art printing & framing stores. They are currently operating in India and United States with plans to expand into Singapore in the near future. 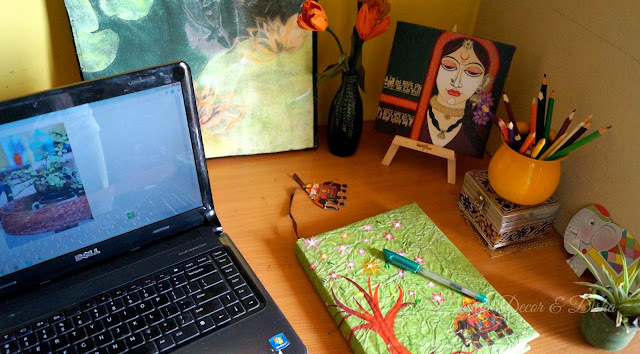 Disha: Do you have something to say to Design Decor & Disha's readers? Padmaja: The art world with its wine and cheese openings, jaw-dropping prices and baffling art-speak might seem like an obviously difficult world to enter. But that’s far from the truth. You are never too late to start your affair with art. You could find your favourite piece of art for its colours, the mood or emotion it evokes in you or the story it narrates to you. And don’t just buy art - experience it! 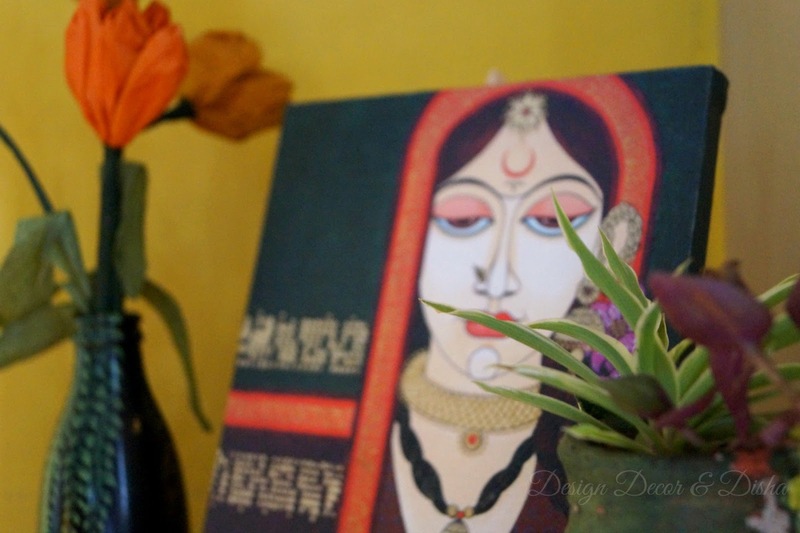 When Padmaja offered me to pick an art piece from Artflute, I was overjoyed. Though the entire collection of artwork on Artflute is brilliant but I had to choose one so I picked the one that caught my fancy. Beautifully done artwork by Varsha Kharatmal. I loved the tiny and elegant easel that came with this beautiful desktop art. It sure has added colors to my desk and my workspace has become more lively. This alluring desktop art has completely transformed the corner. Careful selection of colours in the painting makes space look subtly attractive. Imagine a joy on the face of a person who receives the lovely gift in a carefully packed small beautiful package. Thanks Padmaja for enlightening us with such wonderful information on art and Artflute. I wish you all the success in your future endeavors. You can check out a collection of outstanding artworks by extremely talented artists on Artflute's online store here. I am sure that you will spend hours there, admiring each and every piece of work. These desktop arts not only make a perfect gift but also can add festive cheer in your home. Go ahead and get some for your abode too. Happy shopping!! 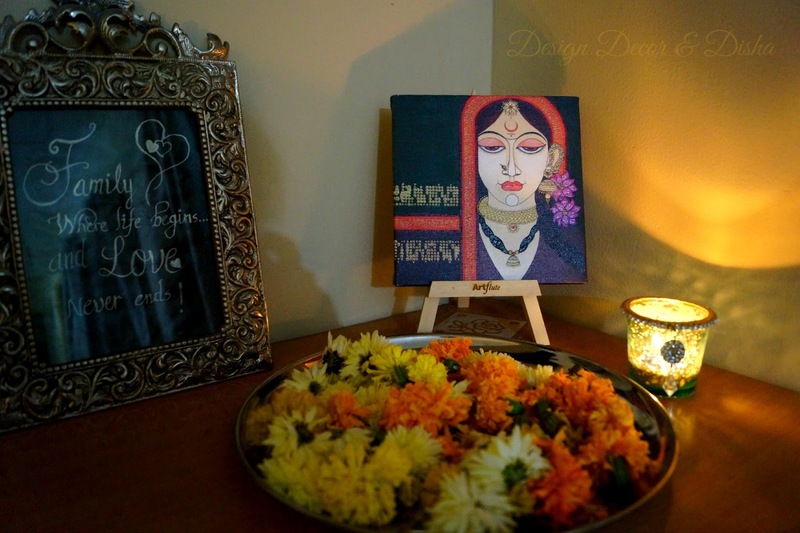 Coming up next is a special guest on the blog to share her Diwali moments with us. Stay tuned! !